20 Minute Taco Pasta is such an easy one pot recipe. 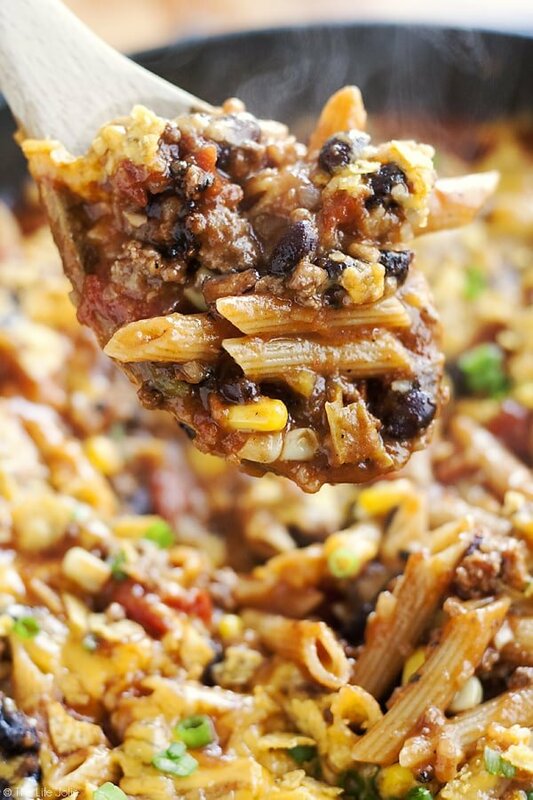 This tasty dinner is made in one skillet with ground beef and Barilla Pronto Penne Pasta. It’s creamy, cheesy and full of great flavor that the whole family will love! This is a sponsored conversation on behalf of the Collective Bias, Inc. and its advertiser. As always, all opinions are my own. Thank you for supporting the brands that help support this blog. This post contains Affiliate Links. Please see the disclaimer here. Do you ever have nights during the week that just get away from you? We sure do. I think this is common whether you work in the home or outside of the home. Life gets crazy sometimes, especially when there are kids in the picture. Each week, I plan our family’s dinners for the weeknights. I try to leave a decent amount of wiggle room. So while it’s not set hard-and-fast for every single day, I have a general game plan for the week and for the most part this works for us. Still, there are always some nights where the day just got away from us and I can’t imagine spending a whole hour cooking. And I say this as a gal who loves cooking! On those nights we often end up ordering take out or grabbing something from a drive-thru. As I have mentioned previously, I’m all for moderation and I try not to beat myself up for subbing in these quick meal options once in a while. That being said, the reality still stands: nothing beats a home cooked meal! So I go out of my way to find and also create recipes that can come together quickly but still taste delicious for those crazy nights when I just can’t deal with making a big production out of dinner. And there are certain shortcuts that are significant in making quick but still delicious meals. One such shortcut (and my new favorite shortcut!) is Barilla Pronto Pasta. The geniuses over at Barilla have created a pasta that allows you to create one-pot meals without having to wait for water to boil or drain the pasta! Talk about saving time in both cooking and dishes! One Pan. No Boil. No Drain. No problem!! I love you, Barilla! You guys, the pasta itself literally cooks in 10 minutes, right there in the pan! I’m talking fantastic, al dente pasta that maintains its shape and texture beautifully! Barilla is definitely doing something right, so much so that this was selected for a Better Homes & Gardens Best New Product Award for 2016! I already knew I loved Barilla products- I’ve been loving using them for years. Barilla is Italy’s number one brand of pasta; it’s an authentic Italian food brand and has no preservatives. I trust the quality that they bring to my meals, especially the wholesome, great taste! So when this collaboration came about, Barilla challenged me to create a delicious one-pot meal to make for my family on these busy nights and to share with you! Naturally, I got excited and jumped right into this head first! I initially considered doing something that is more of an authentic Italian pasta dish. But I love thinking outside of the box and so I began to brainstorm of dinners my family loves, the ones that do require a bit of work. My brain immediately went to taco night. 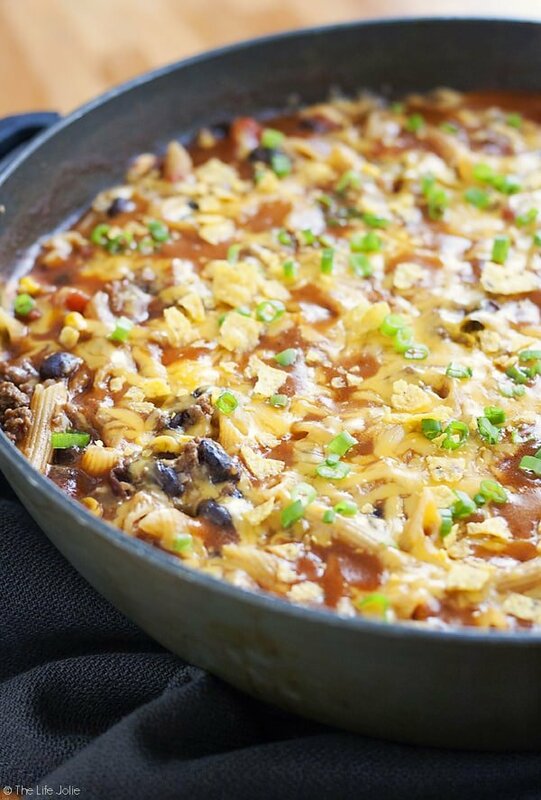 Always a favorite in our home, but since we do our taco meat in the slow cooker, this isn’t exactly a quick meal for us, not to mention all the chopping involved. I immediately knew combining taco night with pasta night would be a an excellent decision, one which was met with great enthusiasm when I was testing this dish out on my family! Why make this Taco Pasta recipe? 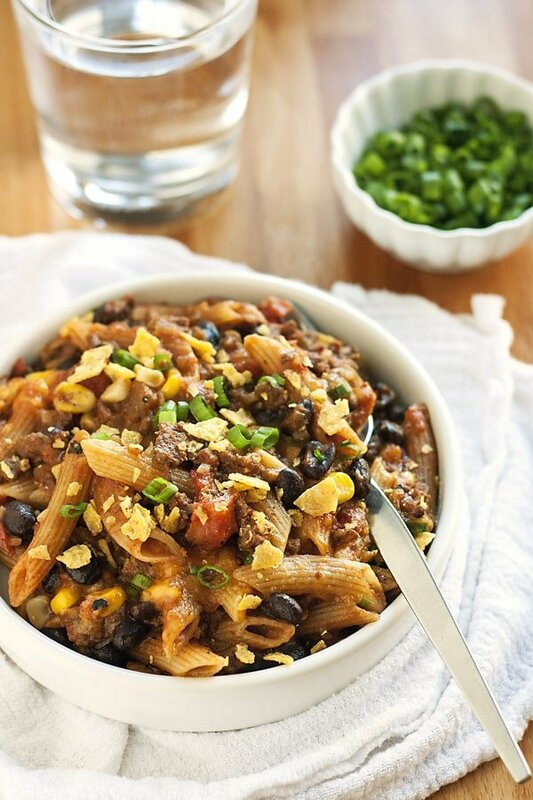 This 20 Minute Taco Pasta is so quick to make (hence the name) but it doesn’t sacrifice any flavor. I went out of my way to minimize the amount of dishes to wash and to use ingredients that would pack this dish with robust flavor! I love that you can easily throw everything together to cook. This was a hit with both the adults and the children in my family. Alice had so much fun pulling different ingredients from her plate and asking us to take those bites together (“now lets all take a pasta bite! How about a bean bite!”). Dinner was extra fun! This is the ideal dish for those busy nights where you cannot imagine making a huge mess and working over the stove for an hour. I was thrilled that I got to enjoy the extra time hanging out with my family instead of cooking and cleaning up all night! Use Barilla Pronto Pasta. This recipe hasn’t been test with regular pasta, so while I’m sure it would work (though probably with a longer cook time) I make not guarantees. Prep all ingredients before you make this Taco Pasta. This is called a Mise en Place and it’s a good idea to make every recipe run smoothly. Do not turn the heat down once you cover it. This is key for using this type of pasta. Feel free to add toppings once the pasta is cooked. Although this is great on it’s own, in addition to green onions and chips, this would be awesome with some guacamole, sour cream, etc. The world is your oyster! 20 Minute Taco Pasta is such an easy one pot recipe. 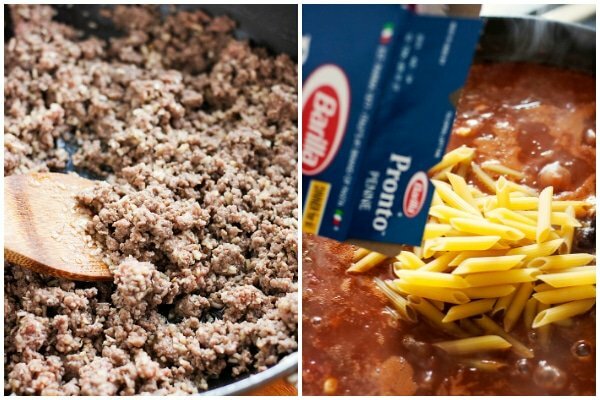 This tasty dinner is made in one skillet with ground beef and Barilla Pronto Penne Pasta. It's creamy, cheesy and full of great flavor that the whole family will love! In a large saute pan, brown ground beef over medium high heat. Use a wooden spoon to break the beef up. While it's browning add dried minced onions, garlic powder and salt and pepper to taste. Once beef is fully browned, add diced tomatoes, diced green chiles, tomato sauce, chicken broth, taco seasoning, undrained black beans and frozen corn. Mix well and bring to this to a boil. Once it's boiling, stir in Barilla Pronto Penne Pasta and cover. DO NOT TURN YOUR HEAT DOWN, leave it at medium-high. Cook covered for 8 minutes, stirring periodically to prevent sticking. Once you're at the 8 minute mark, stir in 1/2 cup cheddar cheese and then sprinkle the remaining cup of cheddar cheese over the top. Cover the pasta again and cook for 2 more minutes. Sprinkle with green onions and crumbled tortilla chips and serve immediately. Looking for some other one pot pasta recipes? January 6, 2017 at 11:09 pm Thank you, Stacey- my family is full of pasta and taco fanatics so this is definitely being added to our weeknight dinner rotation! January 6, 2017 at 11:03 pm Thanks Jo! Yeah, some nights you just need a break! I have been a loyal Barilla gal for as long as I can remember! I hope you enjoy it! January 6, 2017 at 11:23 pm Thanks Veena! Penne is also a pasta-variety-of-choice in our home! I hope you enjoy this! January 6, 2017 at 11:02 pm Thank you, Lisa! I was not even a little bit sad to have leftovers- they made me look forward to lunch! January 6, 2017 at 11:01 pm Awwww, thank you Andrea! Your crew sounds like my kind of people! January 5, 2017 at 11:01 pm The one pot meal is so genius. I love the easy clean up. But you took it a step further and made it quick. WAHOO. Thanks for testing this out. I've been skeptical whether the quicker pasta would taste good. Now we'll try it! February 2, 2017 at 12:18 pm You mention 1/4 minced dried onion. 1/4 what? Cup? February 2, 2017 at 1:24 pm Apologies for the typo- it's 1/4 cup. Enjoy! March 23, 2017 at 12:30 pm This looks amazing! Can I use regular pasta if I don't have the quick cook kind? Would I add it in the same way? March 14, 2018 at 2:47 pm Did you ever try it with regular pasta? How did it turn out? March 26, 2017 at 11:11 pm I'm sorry to hear that! Try Walmart-that's where I found mine. May 12, 2017 at 12:43 am I made this for supper and it was really good. My son said he felt weird eating something that was Mexican and had pasta in it but he said it was good! I skipped the black beans as my family doesn't like them. I put the tomatoes in the mini chopper, my son doesn't like tomato chunks. 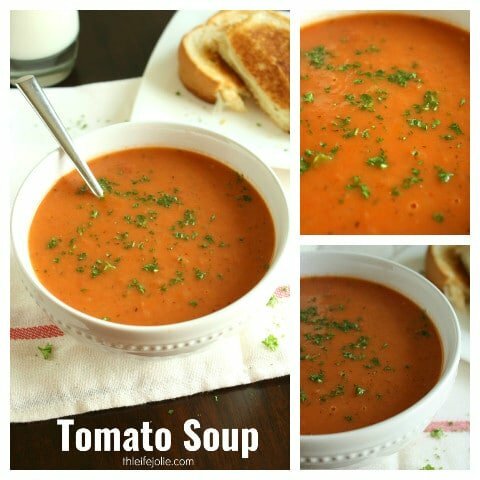 I used 2 cans of tomatoes with the green chilies for 20 ounces, increased the tomato sauce to 2 cans. I didn't have the recommended pasta and just used regular pasta. Had to wait longer for it to cook, but it still tasted great! February 19, 2018 at 3:37 pm Two of my favorite things in one meal! February 23, 2018 at 8:49 pm This looks incredible! I can't wait to try making this! February 23, 2018 at 10:02 pm Thanks Carolyn! April 29, 2018 at 2:41 pm Will it have enough liquid if you drain the fat from the ground beef first? April 29, 2018 at 8:19 pm Hi Renee- there totally is! This one is in our regular rotation, so in addition to the tests I do before posting, we've made it a bunch of other times and it's always come out great (while you want there to be a sauce, you don't want it watery). My advice is stir it a couple times while its covered and reducing to try and keep the pasta from sticking. Enjoy! August 13, 2018 at 1:34 pm Do you think it would freeze well?